How effortlessly the names of world leaders tripped off Lord Howe's tongue - Reagan, Gorbachev, Mitterrand, Mandela, Gromyko, Kosygin, Deng Xiao Ping. He had met them all at various meetings and summits in illustrious career spanning several decades - and his anecdotes and analysis provided the fabric for a fascinating talk on the warm evening of June 12th. A record 135 people packed into the vilhage hall to listen to Lord Howe - a former Deputy Prime Minister, Chancellor of the Exchequer, Foreign Secretary and Leader of the House of Commons. He spoke about his time in office and his recollections of landmark events, such as the hand-over of Hong Kong, early meetings with the Soviet leadership (which refused to discuss human rights), the protracted negotiations over clawing back tens of millions of pounds from the European Union....and Cabinet ministers in their night-clothes padding around a VC10 as it thundered towards Japan. Sir Geoffrey Howe, as he then was, was Margaret Thatcher's longest-serving Cabinet colleague and they had worked together to forge economic and related polices to create the basis of Thatcherism in power.But it was after he became Foreign Secretary in 1983 that divisions began to open up behind the scenes, firstly over South Africa and then - the real crunch - over Britain's place in Europe. Ultimately, the tensions became excessive and Lord Howe resigned on November 1st, 1990 and his subsequent speech in the House of Commons, which ultimately led, just nine days later, to Mrs Thatcher leaving office as both Prime Minister and leader of the party. He likened it to a happy mariage which ultimately broke down in a rather unpleasant divorce. 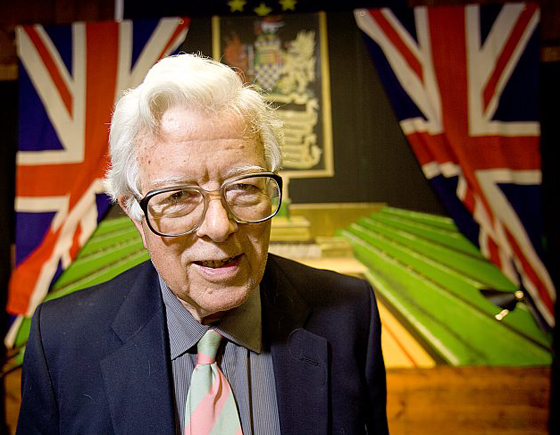 However, Lord Howe was keen to emphasise how much he admired Margaret Thatcher's achievements, considering that he believed Britain was a total shambles when she first came to power in 1979. He noted that he has subsequently sat next to Lady Thatcher in the House of Lords and she has complimented him on his speeches. As much as anybody, he said, he sent his heartfelt best wishes after hearing that she had broken her upper arm in a fall and was recovering in hospital. As usual with a gifted barrister, Lord Howe had excellent comic timing. One outstanding quip was the definition of an economist: "A man who knows 364 different wasy to make love....but doesn't know any women". It was interesting that he felt the administration of George W. Bush had been a disaster and he praised President Barack Obama for his oratory skills and is looking forward to how this translates into policy and achievement. Inevitably, many people associate Lord Howe with Denis Healey's affectionate line that being attacked by him in the Commons was like "being savaged by a dead sheep". However, Lord Howe pointed out that both men have always been firm friends and, indeed, were introduced into the House of Lords in the same week. He has also cleverly incorporated the sheep reference into his coat of arms, which features a wolf in sheep's clothing, as well as a chequered shield referring to Chequers (the Prime Minister's country retreat) and a Welsh dragon, acknowledging his roots in Wales, where he was born nearly 83 years ago. As ever, the food provided by Ann Day and Clare Todd was delicious and this, aided by the wine on offer, provided the nourishment for a very relaxed post-talk atmosphere, with people milling around outside long after Long Howe had sat down. He kindly signed copies of his memoirs, which sold out, and so the profit from the evening was £850, giving a total from all nine talks of £4,150, which will be used for upgrading the village hall. What a great pleasure and privilege to be present at the last of this season's series of Wootton Talks. A warm summer's evening and a very friendly atmosphere - and the chance to hear one of the "Greats" of the political scene in the latter part of the 20th Century. Lord Howe, now in his Eighties, was as articulate as ever and his talk, when he recounted his tremendously varied experiences, proved to be completely absorbing and fascinating. Congratulations to the organisers for such a memorable evening and to Marlene Fisher, whose painted back-drop brilliantly recreated, almost three-dimensionally, the chamber of the House of Commons - Brian Parkinson, Woodstock.